Notification No. SO(SE-REC)2-85/2017 is an issued by Punjab Government School Education sector dated 14-12-2017 on Newspaper Advertisement for Punjab Educators Jobs 2018 below Recruitment Policy 2017-18. It is sent to all deputy commissioners /administrator District Education Authorities in Punjab and all ruler Executive District officers District Education Authorities DEA in Punjab. 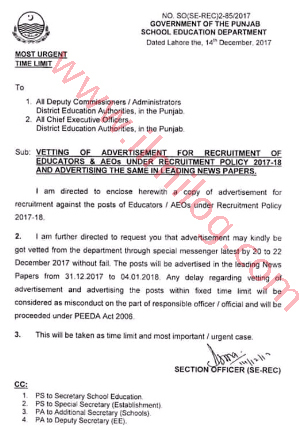 Subject: selection of Advertisement for staffing of Educators & AEOs beneath Recruitment Policy 2017-18 and publicity the same in top newspapers. It is further directed to enclose herewith a copy of the advertisement for Recruitment against the posts of Educators /AEOs under Recruitment Policy 2017-18. It is further directed to request you that advertisement may kindly be got vetted by the department through special messenger latest by 20 to 22 December 2017 without fail. The posts will be advertised in the leading newspapers from 31-12-2017 to 04-01-2018. Any delay regarding the vetting of advertisement and advertising the posts within the fixed time limit will be considered as misconduct on the part of responsible officer /official and will be proceeded under PEEDA Act 2006. This will be taken as time limit and most important /urgent case.